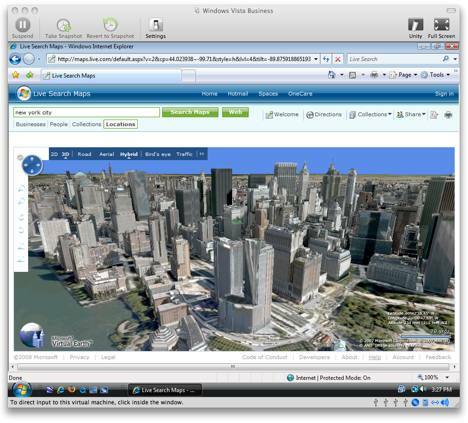 Microsoft Virtual Earth 3D doesn’t yet run in a Mac OS X browser. Until recently, your only option was to install a copy of Windows on a different partition using Apple’s Bootcamp tool, and boot into it. I used to try new versions of the Parallels Desktop for Mac virtualization tool to see if they had added support for VE3D, but all I got for my efforts were very hard crashes, not just of Windows but of the entire machine. When choosing between BootCamp and VMWare, Parallels is the best answer because of its ease of use.